Millimeter-wave radio over fiber is an attractive scheme which is widely used in broadband wireless communication system. 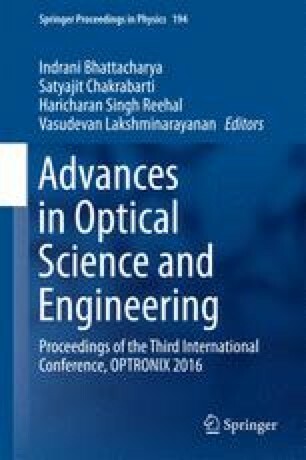 In this paper, a scheme for the optical generation of subcarrier multiplexed (SCM) millimeter wave signal is proposed. In SCM, each RF carrier is modulated by the baseband signal. A group of baseband modulated subcarriers modulate the intensity of an optical carrier. The components required for the scheme consists of an optical pulse source, a WDM demultiplexer, two laser diodes, a photodiode and optical couplers. Two lightwaves are selected from the optical pulse source whose frequency difference is equal to the frequency of the desired mm wave signal. When two lightwaves, one intensity modulated by the SCM signals and the other CW lightwave, are combined and fed to the input of a wideband photodiode, the subcarrier multiplexed millimeter wave signal is generated. The two lightwaves are made phase coherent through optical injection locking of laser diodes. The novelty of the scheme is that no intermodulation distortions (IMD) are produced at the output. The generated mm wave modulated by the SCM signal can be radiated by an antenna over a base station. The phase noise of the generated mm wave signal is also very low in this scheme. No reference low noise mm-wave source is required in this scheme.